Several weeks ago, I was set free. A huge report and a backlog of blogposts hung over me, so my first reaction was desperation. That was soon joined by fear and despair, which surprised me. But dependency is like that—insidious and ignored until the trap closes. There weren’t twelve steps to recovery, just one: my computer began to self-destruct. All by itself, it filled its tired old hard drive, whirring loudly and feverishly (literally). Hours of diagnosis and treatment revealed the only cure was a new one. But it was Friday afternoon so I lived computer-free all weekend. Well … not quite. I read email and news on my iPad. But it wasn’t the internet that had a hold on me. 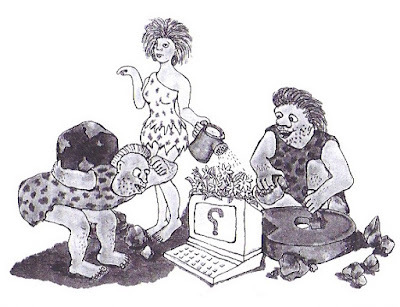 It was something much bigger, more encompassing—the storytelling imperative. I fell off the wagon as soon as I got a new computer, but I’m not ashamed. I had no choice. 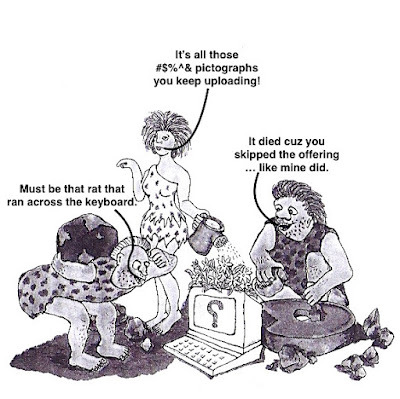 Storytelling is an innate drive—we evolved to be bloggers! Our brains are wired to explain and learn via stories; we remember more when we hear a good tale. Empathy may play a role, and certainly our social nature contributes (more here). But does effective communication fully explain a writer’s need to create a coherent, satisfying, pleasing story that is just right? Think about that feeling of intense satisfaction when a discouraging mess finally emerges as a masterpiece to be joyfully cast into the blogosphere … even with no guarantee that anyone will read it! Evolution makes us do it. We’re rewarded emotionally because stories provide a strong adaptive advantage. When we make stories out of what we experience, we make sense of things. We can predict what’s going to happen in similar situations, and increase our chance of survival. Knowledge accumulates; stories beget science. But this story about storytelling doesn’t tell it all. Many of our stories hardly qualify as useful for survival. Are we caught up in some kind of runaway selection? Does the powerful reward of making sense of things lead us to daydreams, fiction, rationalization, gossip, delusion, spirituality, blogging? 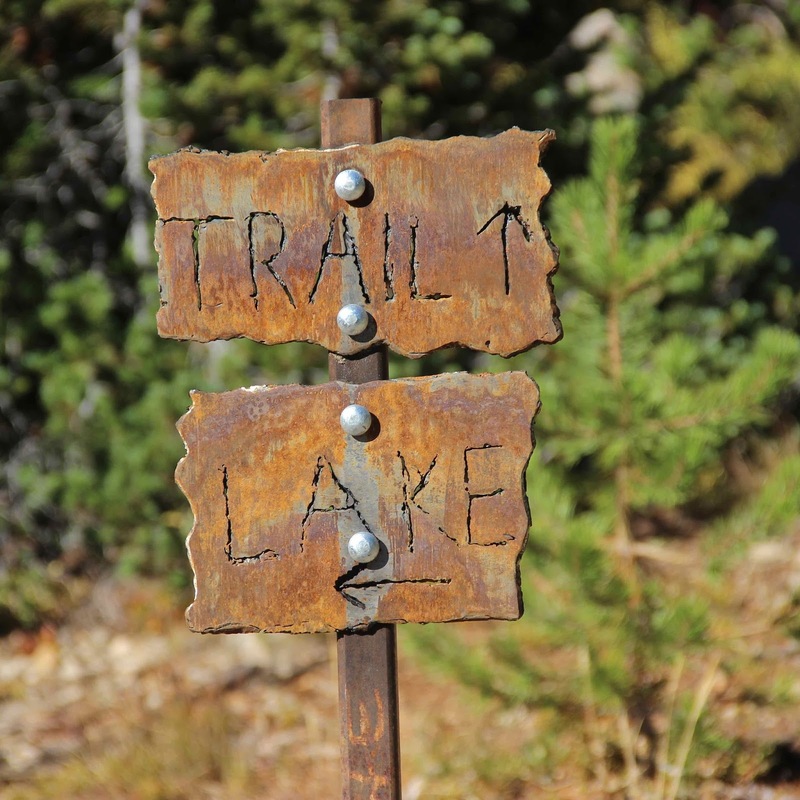 Are you driven to tell stories? Why? Blog posts make good memories last longer. This month I’m making an oblique and tenuous segue from Tree-Following, for I have no news to report of my serviceberry. After a long vacation, all kinds of things have to be done right away! 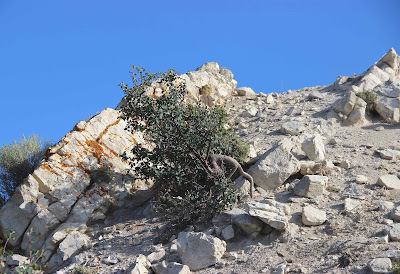 (of course ;-) Instead, this post is about one of its brethren growing nearby under challenging circumstances. Though it’s only a meter tall and technically a shrub, it’s as impressive and inspiring as a tree. 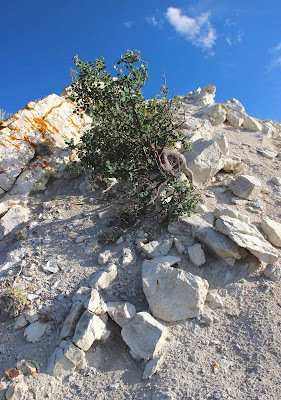 Plant on a pedestal created by erosion. Arrow points to exposed roots (source). 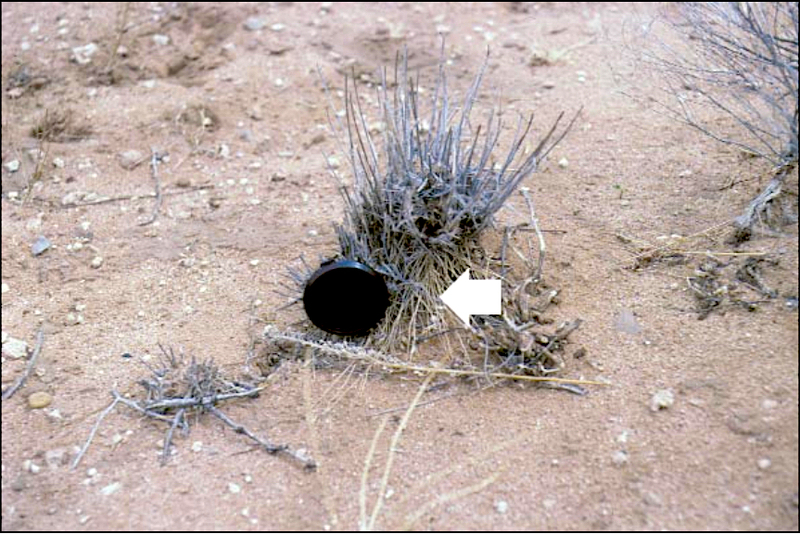 Range managers consider pedestaled plants indicators of over-grazing. A healthy allotment (pasture) has no pedestaling. If mature plants are on pedestals, the allotment is said to be at risk, and the stocking rate should be reduced. 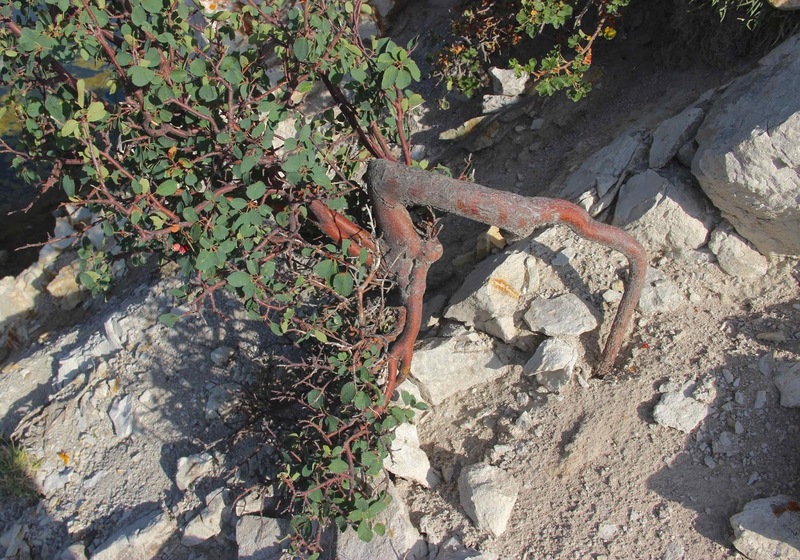 In worst cases, erosion has pedestaled all plants and exposed roots. These allotments are classified as unhealthy. 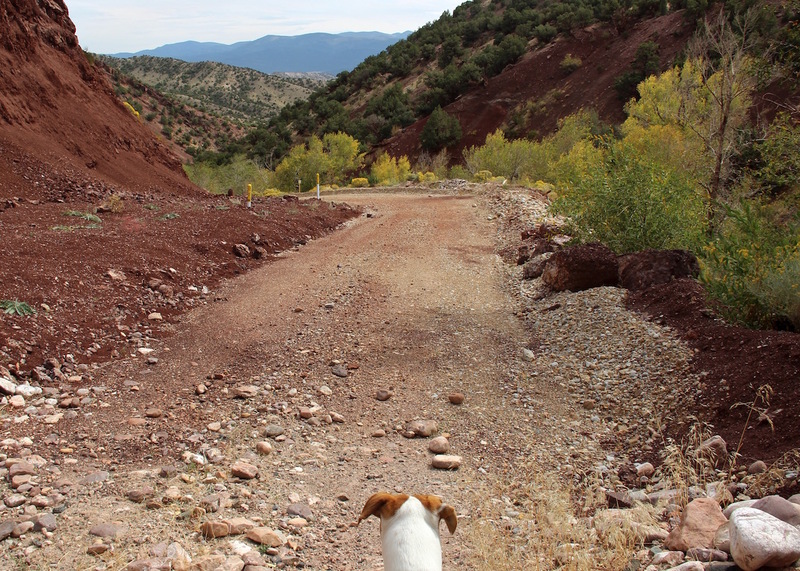 Complete removal of livestock may be necessary for the range to recover. The pedestal has all but disappeared, leaving the serviceberry standing on its roots. But this serviceberry grows where no cow would ever think of going—on a steep slope where there's little to eat. However, slope and rock type make erosion inevitable. 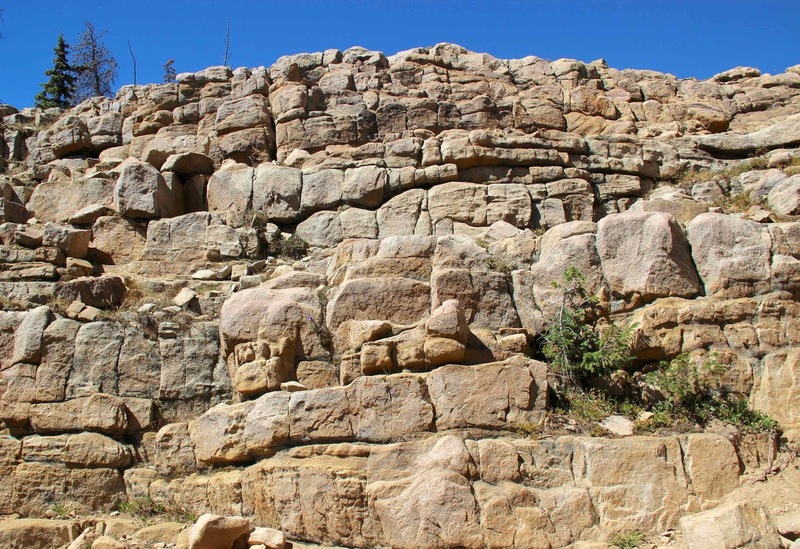 At the same time, the tilted beds of sandstone and siltstone offer benefits. 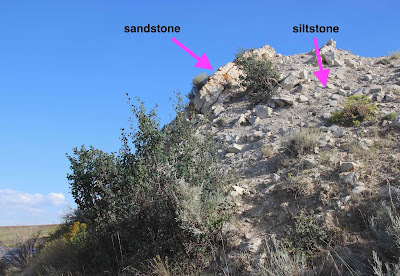 Soil develops from softer siltstone. 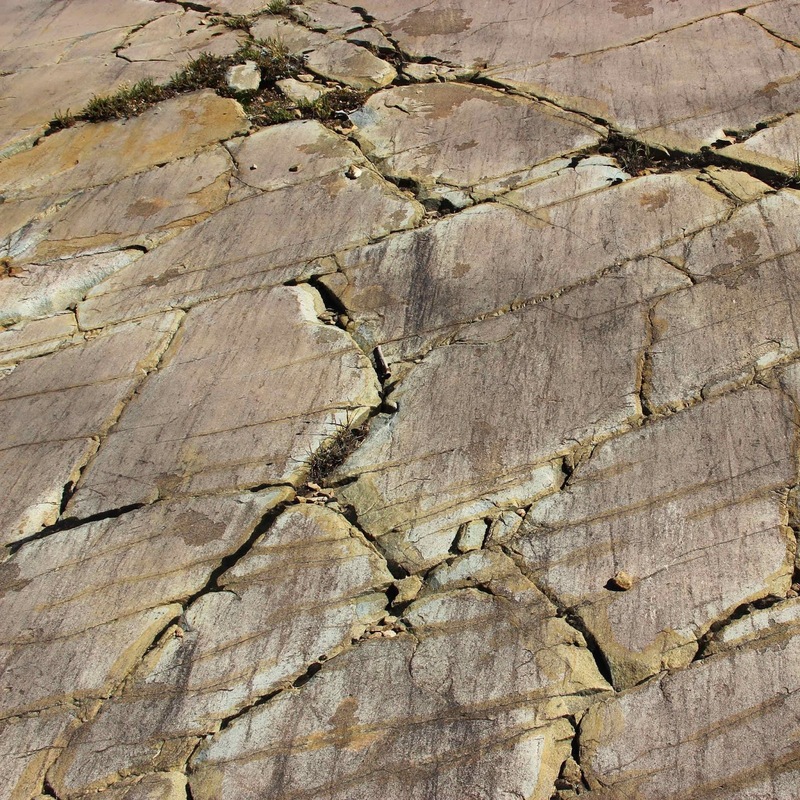 Seeds germinate, grow into seedlings, and send roots down to the water that falls as rain, and accumulates in underground fractures in the sandstone. 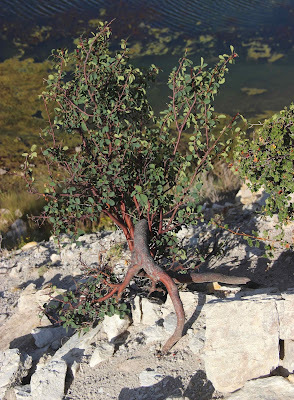 Serviceberry on Boulder Ridge (center of photo); Hutton Lake behind. Photos taken in August. A wild currant grows here too, just visible behind the serviceberry. 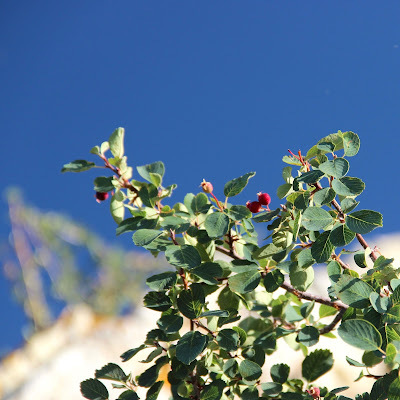 In spite of the tough situation, these shrubs have enough vigor to produce fruit! A wild currant (red) lies next to where the root enters the ground (click on image to view). 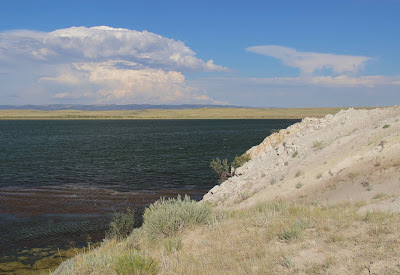 Boulder Ridge on the south side of Hutton Lake, Laramie Valley, Wyoming. 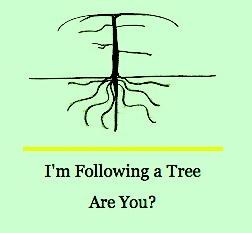 Our monthly gathering of tree-followers is kindly hosted by The Squirrelbasket. 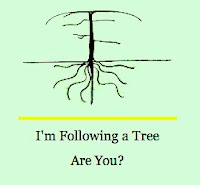 Check out tree news from around the world ... and consider joining us! 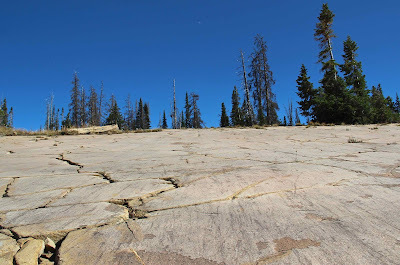 Glacial-sculpted quartzite in the high Uinta Mountains (answer to recent Geo-challenge). Fifty years ago this fall, I chose a topic for my first science paper. I assumed that my parents saved all my early scholastic efforts, but when I had to empty their closets, cabinets and drawers, I found that was not the case. Yet I can still clearly see the report—in a durable black cover with a hand-cut white label hand-printed in large blue font: Glaciers and Ice Ages. That was a formative time, and it’s rare that I look at glacial landscapes without thinking of Mr. Brunello and my first venture into earth science. Four years later I discovered John Muir—adventurer, scientist, and imaginative nature writer. He considered glaciers beauty-makers. His memorable descriptions of their power and artistry strengthened my determination to get into the high country. 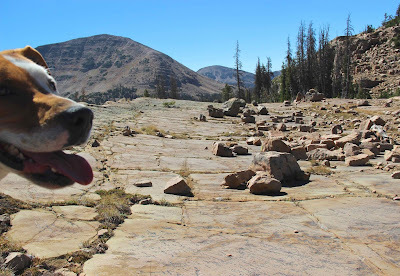 Mr. Brunello and John Muir were with me again last month, in the high country of the Uinta Mountains (northeast Utah). It was just 10,000 years ago that glaciers finally departed, melting away when there no longer was enough snow and cold to grow. They left behind high broad basins with “homes made for the meadows and the lakes, and fields waiting for forests” … and lots of rock. 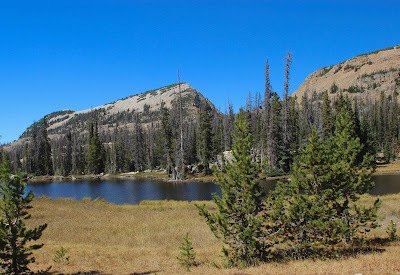 En route to the Notch (center skyline), past one of many lakes, ponds and meadows. 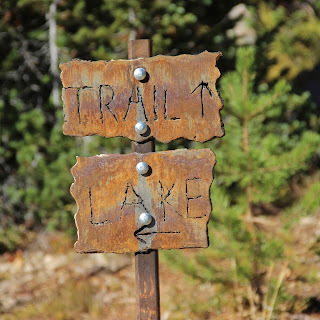 From the Crystal Lake trailhead, I hiked north to the Notch—a low point between two peaks and a divide between two drainages. It's 10,600 feet above sea level, close to the surface of the old ice cap. 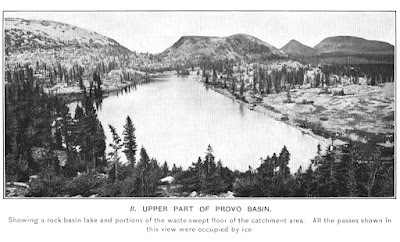 Above, piles of fallen rock had been spared; below, the basins were largely free of debris—swept clean by glaciers. East of the Notch is a pile of fallen rock at about 10,800 feet—above the height of the ice cap. Felsenmeer (rock field) in foreground, at 11,400 feet on Bald Mountain a few miles east of the Notch. Bald Mountain, Reid's Peak (mid-photo), and Notch Mountain were nunataks that stood above the ice cap. 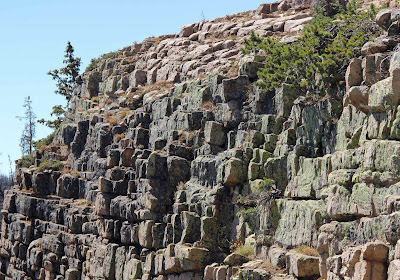 In the Notch, I wandered around on scratched and polished rock littered with blocks. 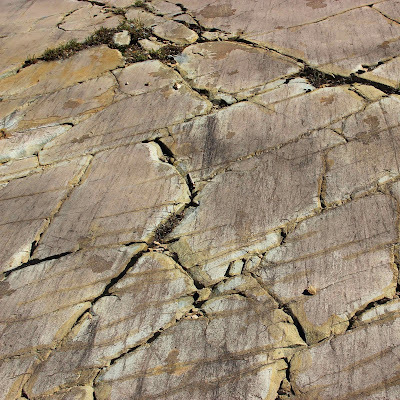 Glacier bottoms are often likened to sandpaper because they’re covered in grit—embedded boulders, pebbles, sand and dirt that grind away at rock surfaces. 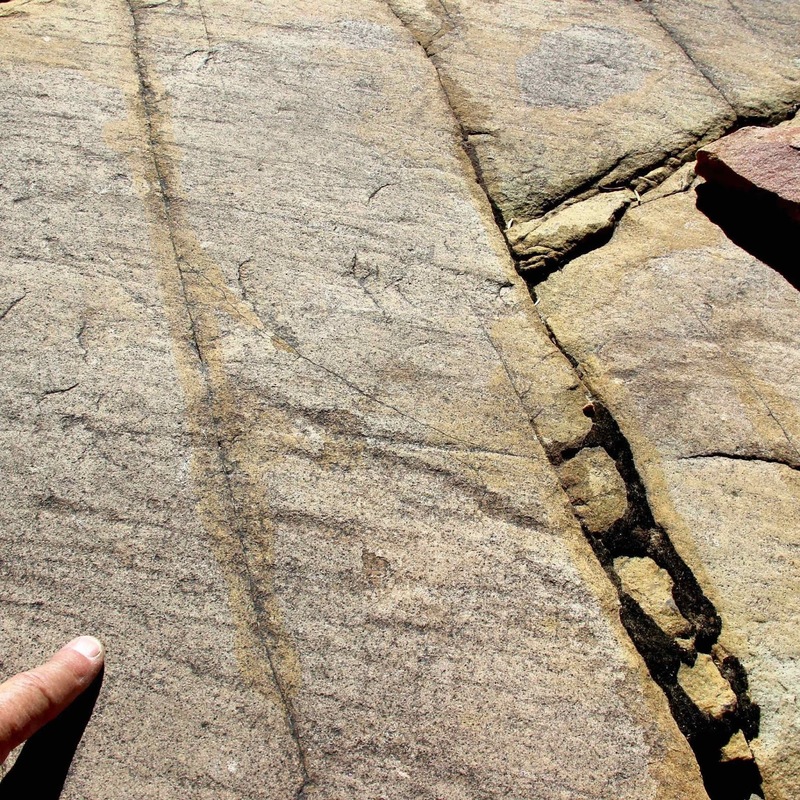 Larger fragments carve grooves and etch long parallel striations; finer material polishes the rock. Glacial polish at the Notch. 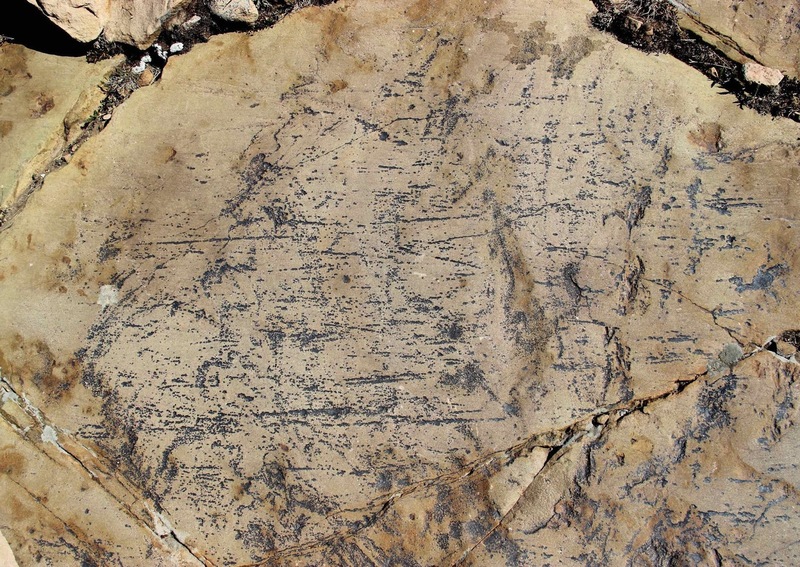 Note regular fractures and blocky rocks (more below). 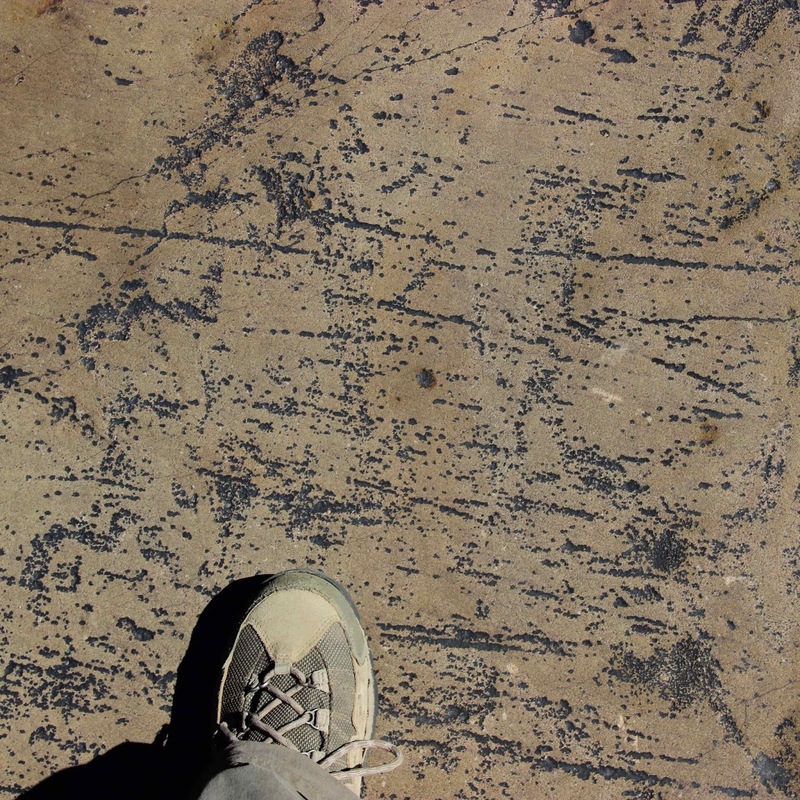 Many striations were black. Is this algae or lichen? or weathering? 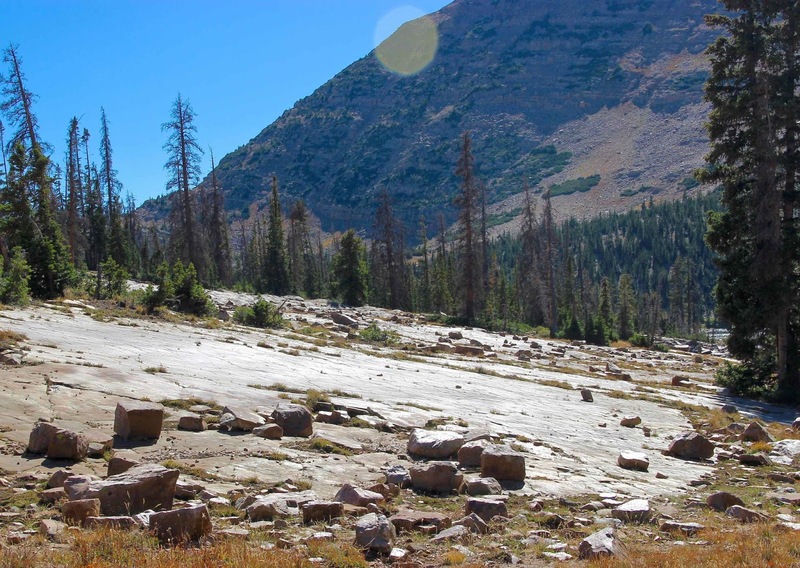 Glaciers carry rocks on their surfaces as well as below—those that fell or slid down onto the ice. They're left behind when a glacier melts, randomly scattered about, often far from their source—hence the term erratic. 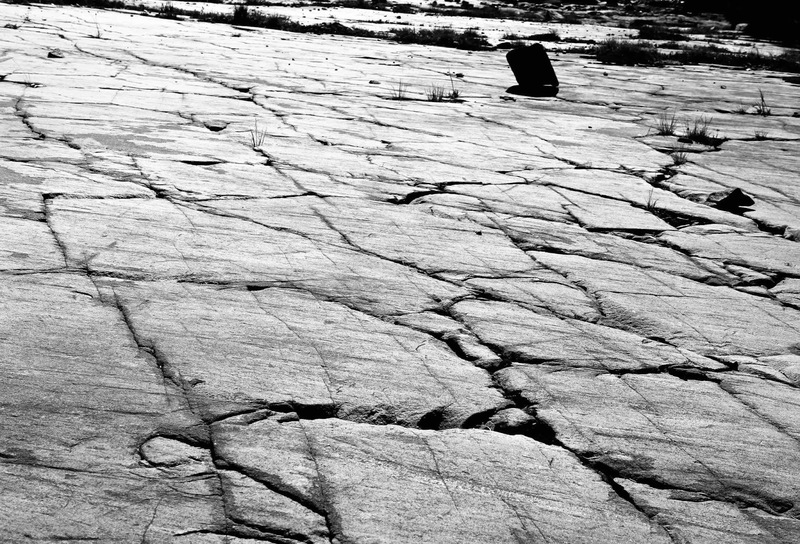 Blocky erratics scattered about, in this case not far from their source. 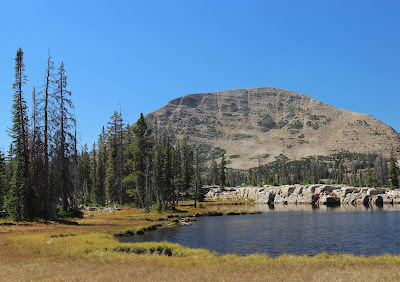 From the Notch, I hiked back down into the waste-swept basin and on to Clyde Lake, one of at least 70 lakes in the area covered by the ice cap. On the east, the lake was bounded by a long roche moutonnée glowing in the sun. 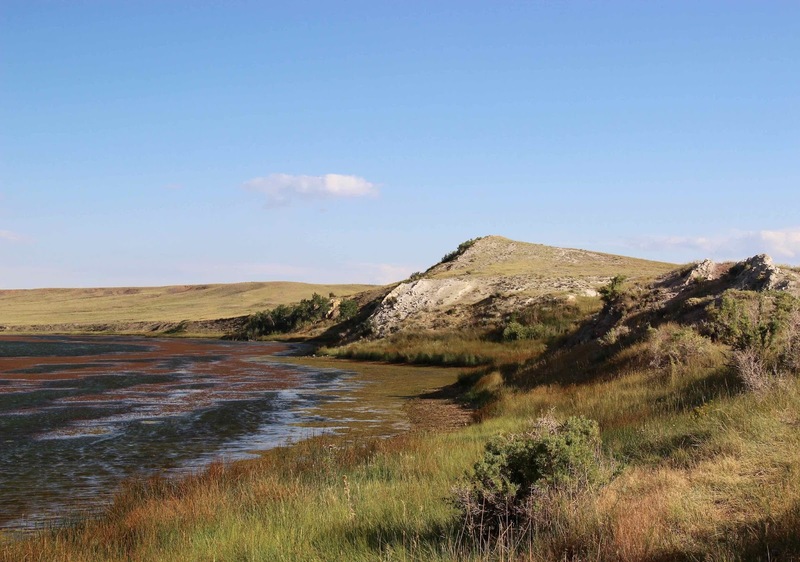 Glaciers create these asymmetric ridges by grinding a gentle slope on the upstream side and plucking rocks to form a steep step downstream. “Roche moutonnée” may mean sheeplike rock, or it may refer to wigs once fashionable among French gentry, which were smoothed over with mutton fat (source; discussed here). 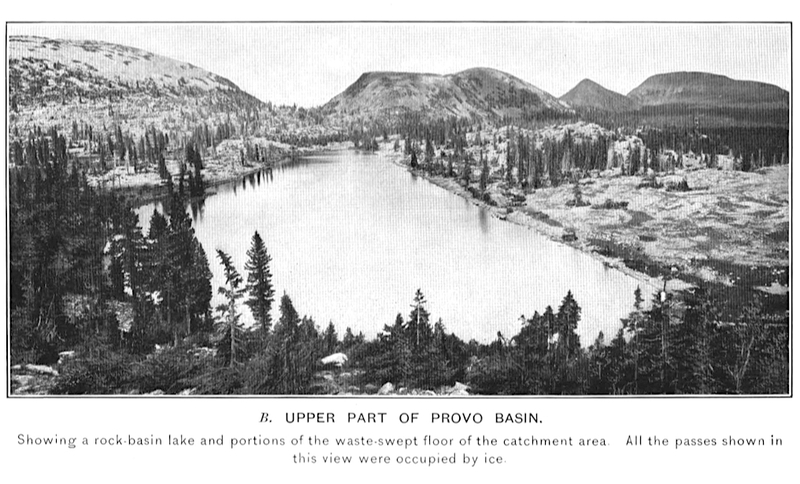 “Showing a rock-basin lake [Clyde Lake] and portions of the waste-swept floor of the catchment area.” (Atwood 1909). 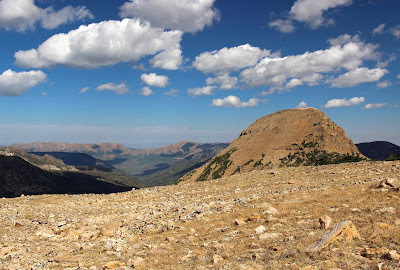 On skyline: Notch Mountain split by the Notch, Reid's Peak, Bald Mountain. Roche moutonnée on right. 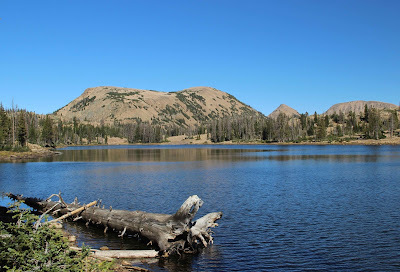 Clyde Lake with east half of Notch Mountain, Reid's Peak and Bald Mountain behind; 2016. 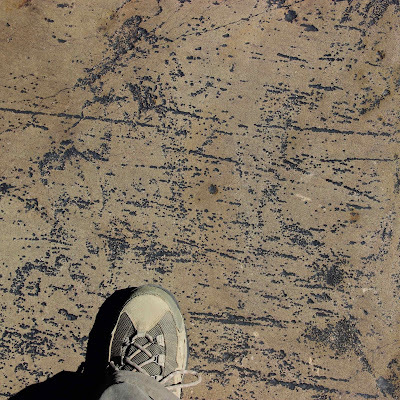 The roche moutonnée at Clyde Lake has a beautifully polished slope with a regular system of fractures, I suspect due to the sedimentary heritage of the rock. Graininess of the quartzite made rock identification difficult in the geo-challenge. 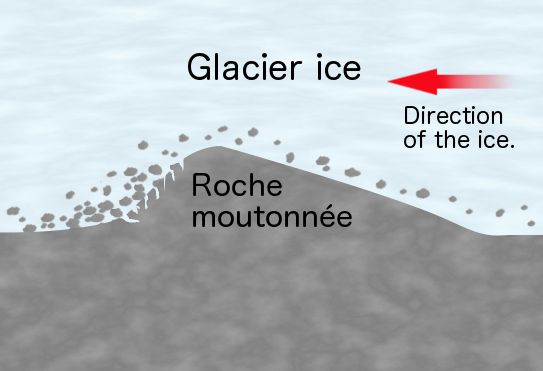 Glacial landscapes are shaped by the bedrock as well as by ice. In the Uinta Mountains, glaciers mostly worked with quartzite—but barely. 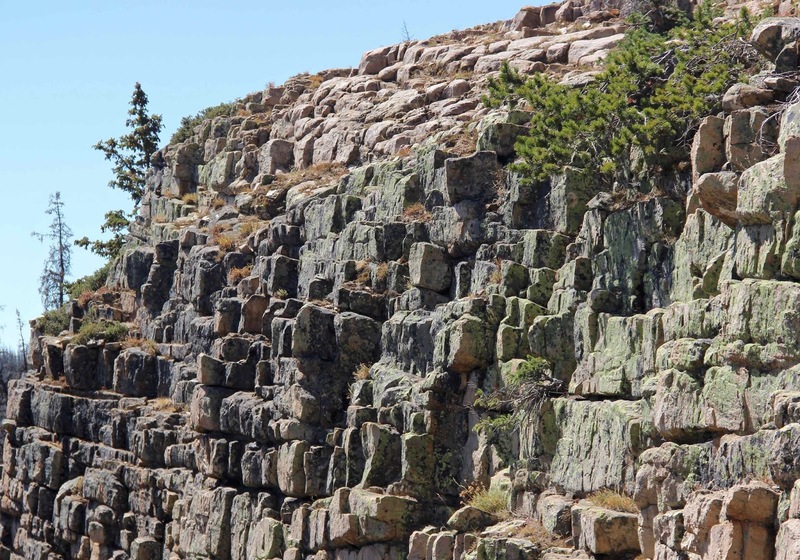 Metamorphism was low-grade, so these rocks are softer than typical quartzite. 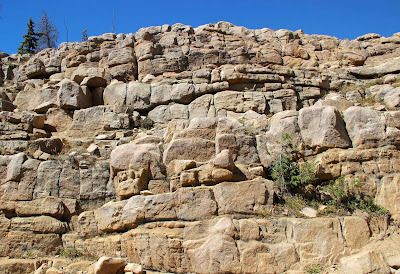 The bedding and graininess of the progenitor sandstones (technically quartz arenite) are often visible, and in places the rock is sandstone. 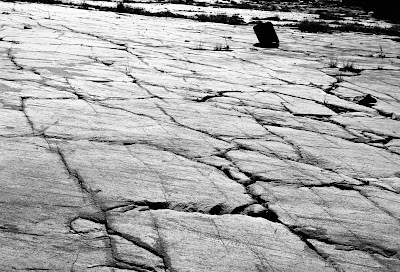 This was my first exposure to glaciated metasedimentary rock, and the novel patterns and forms were irresistibly photogenic. Orientation of rock beds also contributed to glacial artistry. 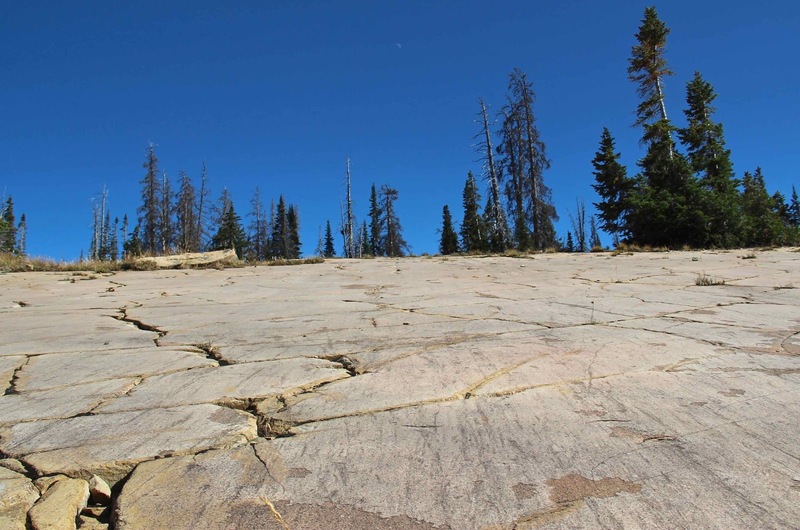 On the broad crest of the Uintas, strata are nearly horizontal, which is conducive to large areas of polish and striations, and shallow depressions for lakes, ponds and meadows. Flat areas are separated by steep steps where glaciers plucked out rocks. Nearly horizontal quartzite beds on Mount Watson, behind small plucked step. Blocky step below the Notch. Another view of horizontal fractured beds below the Notch. Atwood, WW. 1909. 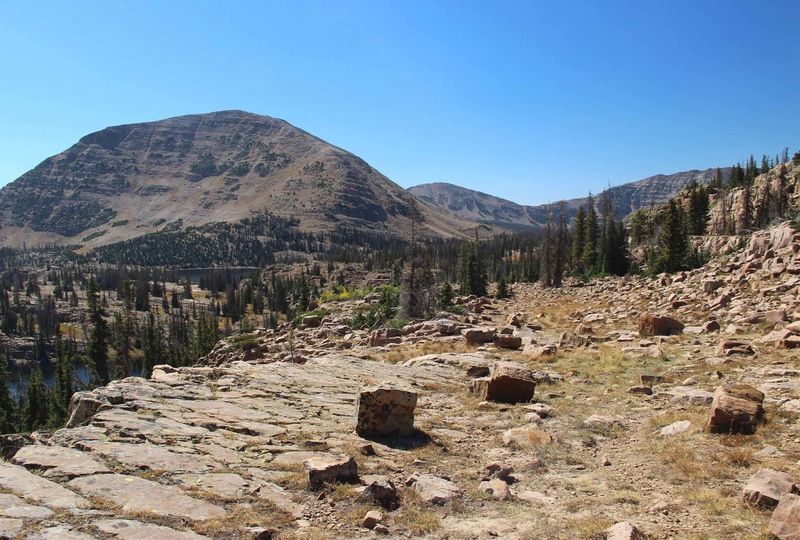 Glaciation of the Uinta and Wasatch Mountains. USGS Prof. Paper 61. Kelly, M. 2012. 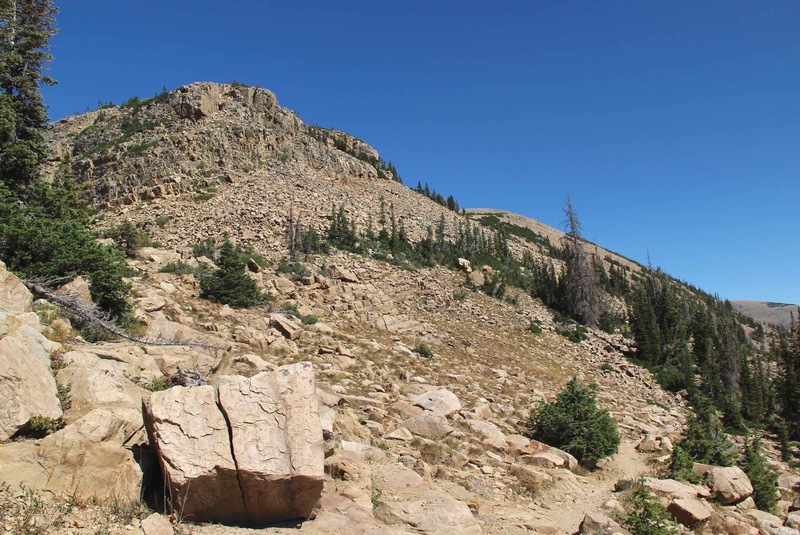 Influence of structural variability on glacially-eroded steps, Uinta Mountains, Utah. MS Thesis, Geology, University of Illinois at Urbana-Champaign.